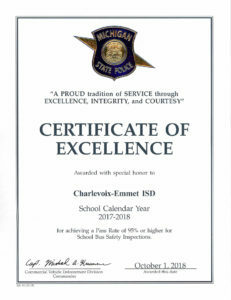 CHARLEVOIX – Michigan State Police inspectors meticulously review nearly 17,000 school buses around the state each year – one at a time – to ensure that children are being transported safely in vehicles that are well-maintained. Safely transporting the children in its care is a responsibility that Char-Em ISD’s Transportation Department takes seriously – and it shows. The ISD has once again landed a 100% safety inspection rating from the MSP for this year’s inspection. Haldaman said his team works in concert with school bus drivers, mechanics at Northern Michigan Truck and Equipment Repair, and the inspectors to ensure compliance in all areas. Char-Em ISD’s Transportation Department covers a three-county geographic service area extending to the north from central Antrim County through Charlevoix and Emmet Counties to just south of the Mackinac Bridge, and from I-75 west to Lake Michigan – roughly 1,200 square miles. 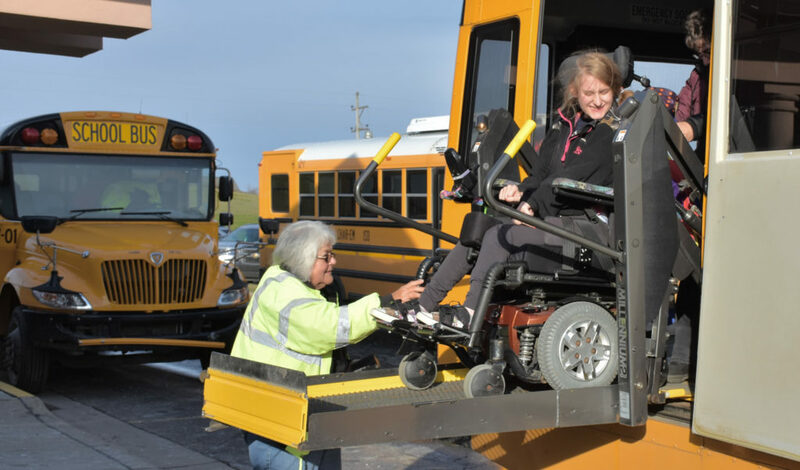 Each day, Char-Em transports about 125 special needs students to and from their homes to any of five different school sites via 24 buses. Those buses accumulate more than 600,000 miles per calendar year. The ISD’s Transportation Department is comprised of about 40 full- and part-time staff, in addition to administrative and routing support, and private sector mechanics – all of whom deserve credit, Haldaman noted, for another stellar inspection report.